Can I optimistically state that most of this week is over and we are so close to weekend? Right now on my end there are some travel plans going on but they can't be concluded. I am so trying to convince hubby to visit one of my favorite places on earth, beautiful country, lovely people, great food and lots of brushes, you know where I am talking about. We couldn't finalize the plans yet though, *sigh*. 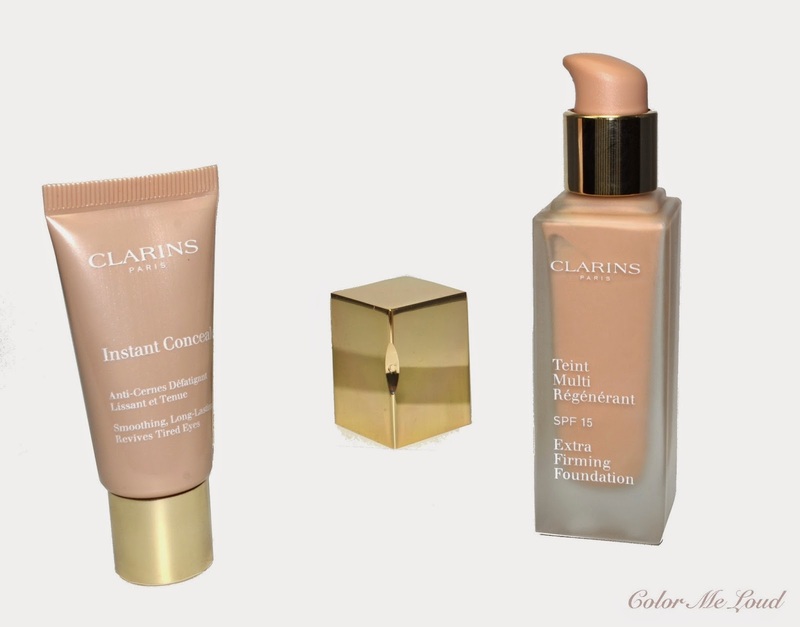 Going on with my mission of reviewing as many base products as possible, today I would like to share my thoughts about Clarins Teint Multi-Régénérant Extra-Firming Foundation and Instant Concealer which I was testing for the last month. 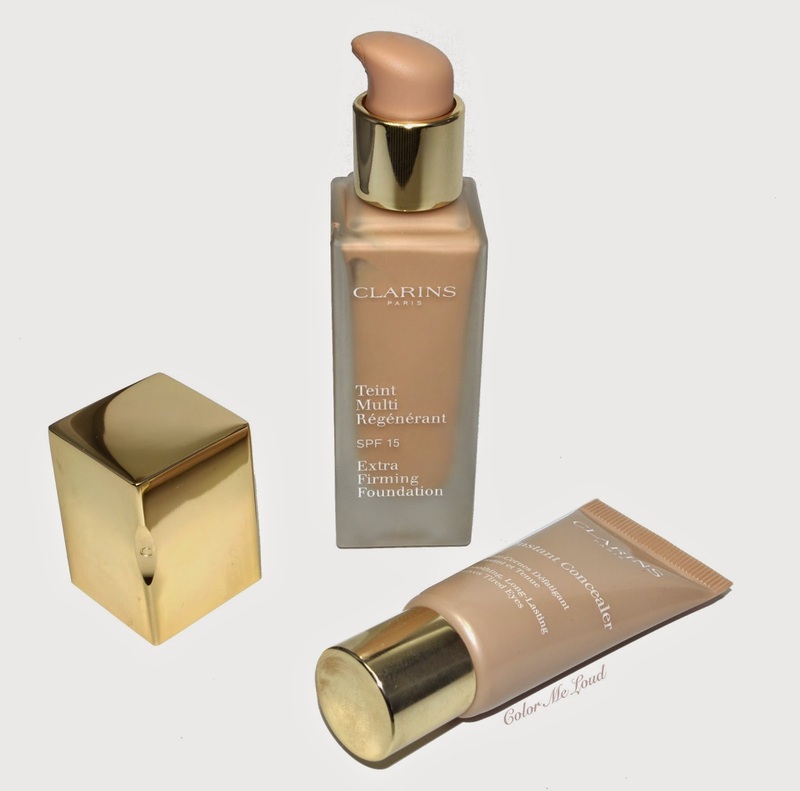 Clarins Teint Multi-Régénérant Extra-Firming Foundation comes in a milky glass bottle and a pump which is hygenic and easy to use. Pump dispenses a good amount of product and can be stopped in between if less product is needed. Foundation has a plastic cap over the dispenser which is coated in gold. I like the packaging very much, it is practical and feels luxurious. I would classify the coverage as medium buildable. I have tried different applications, with fingers, with a wet sponge and with duo-fiber brush. I prefer the application with fingers but if less coverage is needed, a wet sponge does the trick to sheer it out. The finish is velvet and if you have normal to dry skin like me, you don't need to powder on top. On me it does emphasize dry patches very lightly. I have a dry area between my eye brows and until this date I couldn't find a velvet finish foundation which didn't make it look dry. Yet again even without foundation it looks dry, so probably foundation is not to blame after all. That said if you have really dry skin, I would recommend that you try out Clarins Teint Multi-Régénérant on your face before buying. Another note to add is that this foundation comes with SPF 15. My Clarins Counter in Breuninger has very nice foundation samples and they provide it in different formulas and colors! Yes as trivial as it sounds, many companies only give away samples in one certain shade and they would tell you "try it out at home, if you like how it feels you can come and we can check the shade". *shakes head* A big thumbs up to Clarins for getting over this and providing actual samples which one can really also try out without scaring out the postman and even to work to find out how it looks throughout the day. I have matched myself with 108 Sand after I was provided different shades testers at the counter. #108 Sand is a light to medium shade with neutral undertones. If you are NC20 but less yellow, this is what you should go for. #107 has more pink undertones but similar lightness. Clarins Teint Multi-Régénérant Extra-Firming Foundation comes in 6 shades in Germany, which I find to be a little restricted but there is a good chance for those with light-to-medium to medium skin tones to find a match. You can see that #108 Sand is almost the same as Chanel Vitalumiere Aqua B20 and YSL Fusion Ink B20. Tom Ford Traceless Perfecting Foundation #03 Fawn is a tad warmer. What I like about how it looks on the skin is how it captures the light. This is why it looks more skin like and less foundation like if that makes sense. Currently I am not in desperate need for its firming effect but it doesn't harm either. All in all I really like the product. You can see below how it looks like when applied with fingers and without any powder. 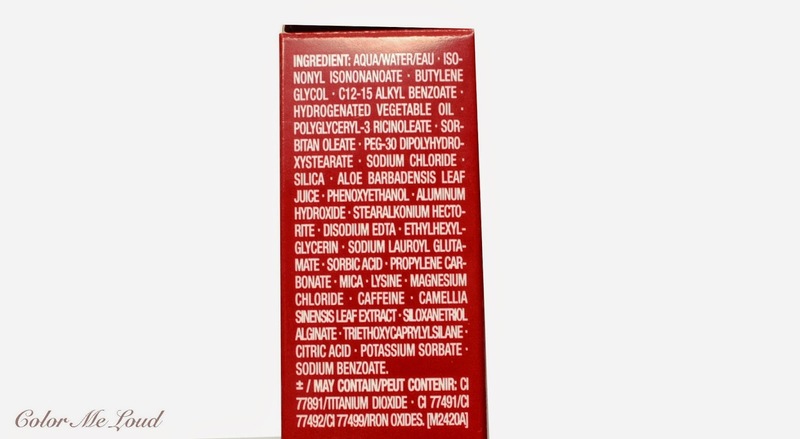 Here are the ingredients list for those who would like to check out if there is something inside which doesn't work well with their skin. I personally find Talc to be a little problematic for my dry skin but those with combined complexions may find it useful. The only thing I don't like about Clarins Teint Multi-Régénérant Extra-Firming Foundation is the perfume. It has a coconut kind of scent which flies away after application but I don't see the point in including it on the first place. Oat extract and plantago major seeds are said to be the extra-firming bits in here. 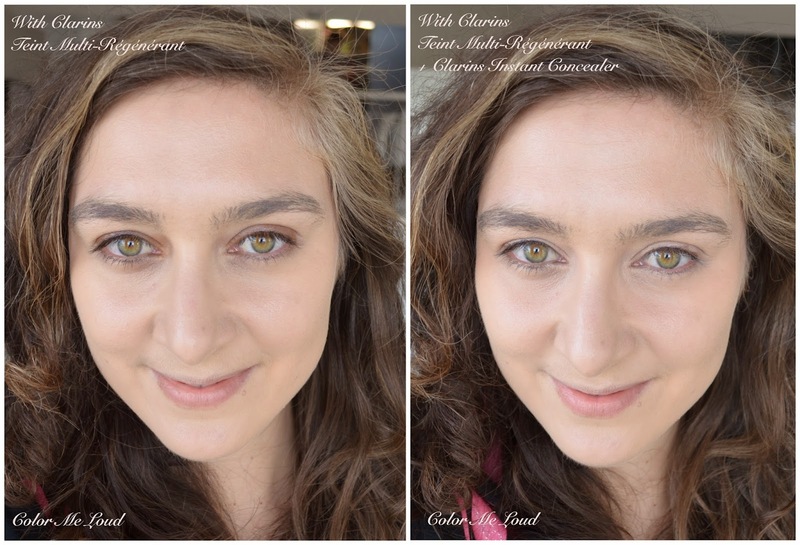 To start with a spoiler, Clarins Instant Concealer became my holy grail concealer as soon as I tried it on. Seriously if you have dryness under the eyes and you are searching for an under eye concealer which lasts without getting uncomfortable, you have to try this one out. Clarins Instant Concealer comes in a plastic squeeze tube and a twist cap. I like this packaging compared to the sponge applicators which most of the concealers in market come with. I apply a tiny dot at the back of my hand and tap that under my eyes with my ring finger. I then set lightly with a transparent powder, it lasts whole day without creasing. 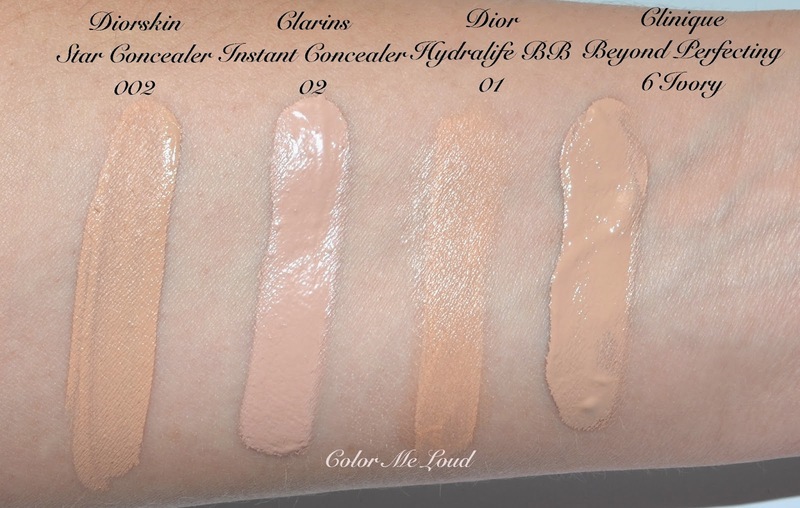 Clarins Instant Concealer comes in 4 shades and good news is that #02 is perfect for my light to medium skin tone. Yay for the very fair ladies who are struggling to find a light concealer, you might have a good chance with #01! You can see from comparison swatches that other concealers which I have in rotation at the moment have more peachy undertones, which are great for my olive tones under eye rings. Clarins Instant Concealer #02 though makes a good job in brightening the area with its rose undertones and I like the result in there too. You can find my other reviews of: Diorskin Star Concealer here together with Dior Hydralife Concealer and Clinique Beyond Perfecting Foundation/Concealer here. Below I added a touch of Clarins Instant Concealer on top of the foundation. You can see that it indeed brightens up my under eye area and covers the dark circles. The formula blends like a dream and doesn't tug or drag during application. It also doesn't set in the lines. I am really loving it! Finally here are the ingredients if you would like to check it out. I think the awakening claim comes from caffeine. Have you tried any Clarins base products? What is your favorite concealer at the moment? Aaaa, I returned the concealer today:-( 2 weeks ago Debenhams had -10% off beauty and I wanted a new one. Read the reviews and decided on Clarins. They didn't have 01, so the salesgirl suggested that I can buy 02 and later exchange it for 01 so I could still use the discount. So I did. Unfortunately, I went back four times and they never had it so I gave up today. I was also scared that it might be too heavy and make my skin dry. Now I regret it. Hey Sara, I've heard great things about that concealer! For the moment my favorite undereye concealers are Dior Diorskin Star for dressier days, and MAC Matchmaster for normal days (because you see, I can apply with my finger). The MAC one is pretty emollient so I might actually use it up at some point (as opposed to the CdP one which I don't think I'll ever finish). Glad to hear you like both! Hi Sara, thank you for another great review. 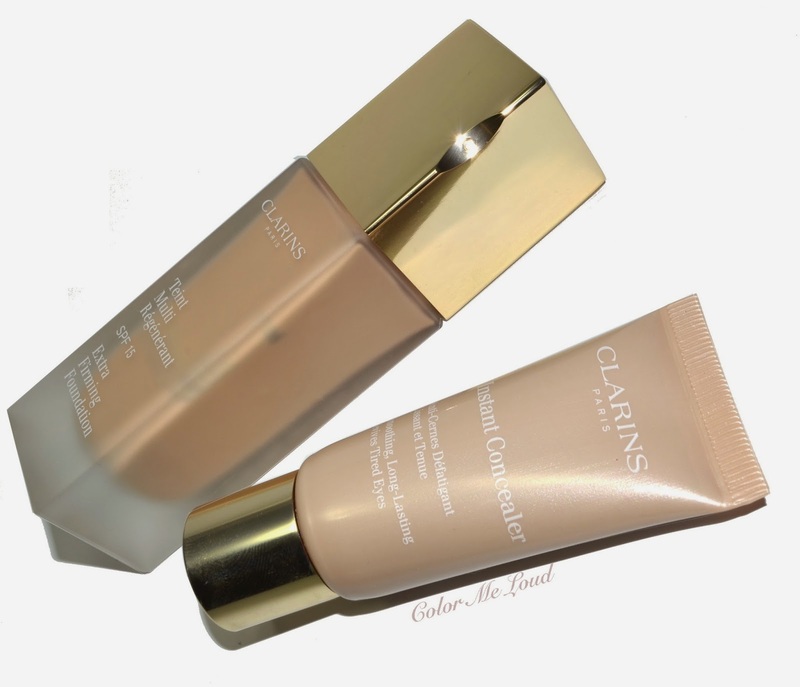 Which foundation do you prefer the Clarins one or the Silk Creme from Laura Mercier? Thanks. Wow, that foundation looks great on you. Covers everything, looks natural, not flat, good color match, and SFP 15. Woohooo! Oh this foundation looks amazing on you!! Frankly i don't see no dry spot... your skin looks great! aww, don't worry, they will have other sales for sure, you can grab one with the next one. I am wondering are you really so fair? Because 02 is perfect for me and I am NC15-20 at the moment (end of winter, pale skin). 01 must be below that, something like NC10 or something. Here I checked online, in Germany both 01 and 02 are sold out at Clarins' webpage, they are rather hard to get, but they live up to expectation. I am also loving Diorskin Star, it has the light reflecting particles, which bring light. This one has a similar property. By the way you have no dark under eye circles, lol, so probably you don't need any of those. Mine are quiet prominent. if you don't have problem with fragrance and you are dry to normal, I would recommend this one. You are right though, they have similar textures. I like them both. yes so SA told me it for people over 40 but I don't see the point in there. I have dry skin and this one fits the bill. I must admit the foundation impressed me, your skin looks absolutely perfect, as you well said, just like perfect skin and no foundation at all. Unfortunately I think I have got all the fronts cover with my foundations and I can't find an excuse to get this one. However, the concealer, THAT is something I am in desperate need for! yes, in fact I stopped my regular concealer and replace it with a lighter more luminous one simply because of the dry area around my eyes, so I need to try this one! I wonder if they would have testers here too? Thank you. :) I'll ask for a sample. 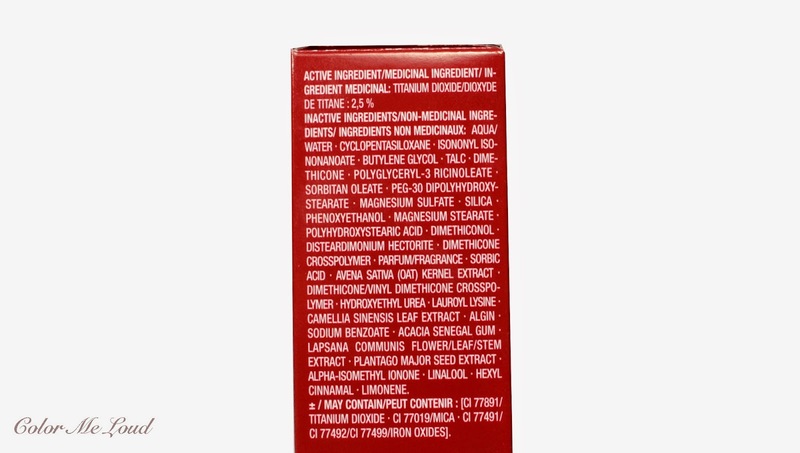 It's helpful as you say that Clarins have samples in all shades. The foundation is really something, isn't it?! I mean, your skin is already good to begin with but with the foundation on, it doesn't even look like real skin and I say this in a good way of course. It's like a porcelain doll kind of skin! Flawless! Yeah, I'm that pale. Mind you, I'm after 4weeks in the tropics. I wanted 02 to work, it didn't :-) I'll try to get my hands on it next time. yes I am loving the foundation, the finish is really pretty! Thanks you very much. 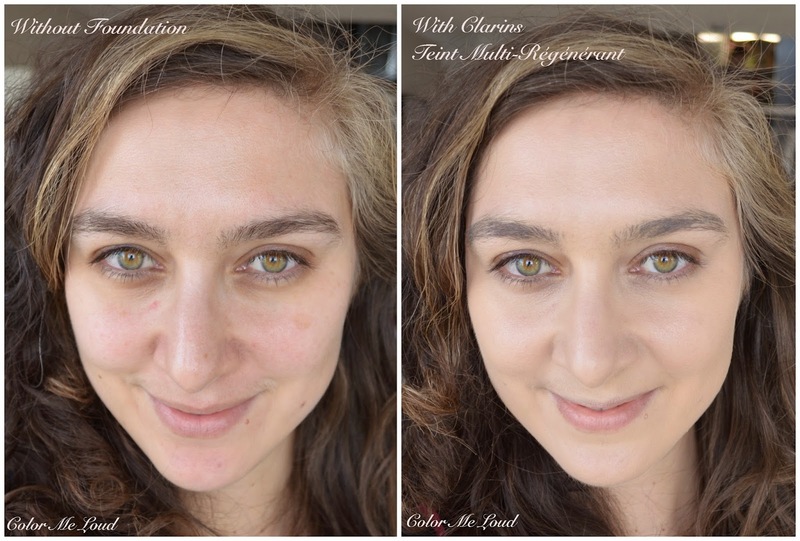 Clarins Concealer is something you should check out after the one you use it finished. Then let me know how you like it. Which foundation are you loving at the moment? Concealer tester... hmmm... never seen any of those in any brands. Now that you mention, I wonder if they have it. LOL yes, stalk it and I am sure you will find one :-)) Then let me know how you like it. All other brands should do it too! I have read so many great things about that concealer, I might have to try it. I do love how it brightens your under eye area although your whole skin looks pretty flawless with no products at all! I love the concealer... it's been the best I've tried for my undereye area so far.